This chair is an excellent addition to your living room. This piece features a cozy boxed seat cushion and loose pillow back, creating a soft place to relax. Meanwhile, this piece incorporates more stylish features, like rounded arms with a slight flair and tapered wood block legs. This piece is available in multiple fabrics and leathers, so you can special order it to match perfectly with your decor. 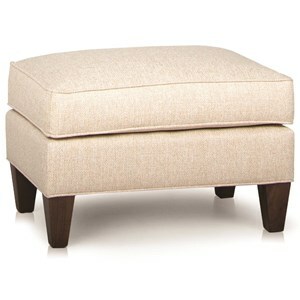 For a complete look, pair this ottoman with the coordinating upholstered chair. The 944 Upholstered Chair with Track Arms and Tapered Wood Block Legs by Smith Brothers at Wayside Furniture in the Akron, Cleveland, Canton, Medina, Youngstown, Ohio area. Product availability may vary. Contact us for the most current availability on this product.